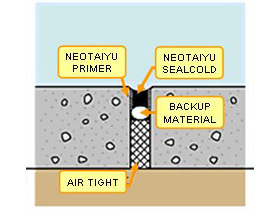 NEOTAIYU SEALCOLD is a polysulfide-based two-component mixing type cold applied joint sealant. It conforms to U.S. Federal Standard (FS/SS-S-200E). Has outstanding oil resistance to jet fuel oil and other types of oil. Behaves as an elastic body between -30℃ and 100℃. Does not become brittle at cold temperatures during wintertime, and does not become soft or extruded at high temperatures during summertime. Does not cause combustion even when subjected to instantaneous high heat, and has excellent heat resistance and flame resistance. Because it has strong adhesive power, and has excellent flexibility and elasticity, it closely adapts to the expansion and contraction of the joints. Since it is in a liquid form at normal temperatures before mixing, implementation and handling will be easy. 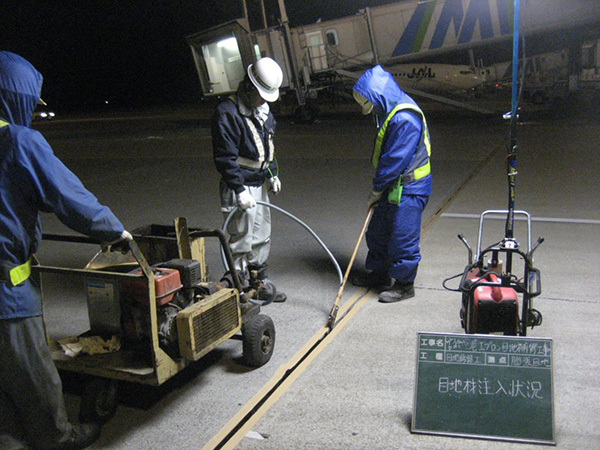 It is a lead-free material that is considerate to the environment.